Gosh...where do I even start with this one? Little Hannah's birth story is a doozie. As in...this is by FAR, the craziest birth I've had the opportunity to be a part of! On Saturday, January 7, I received a text from Jessica, the doula that was going to be working with Amanda. She introduced herself briefly and told me that Amanda had been having contractions 3-5 minutes apart and they were headed to the hospital. I was at a local workshop, so I prepared to leave on a moment's notice, but before I could do so, Jessica texted back to say that Amanda had been sent home with dehydration. I was secretly relieved because BIG FAT SNOWFLAKES had begun falling out of the sky, and Willamette Falls Hospital was about 30 minutes from my house! Fast forward to Tuesday, January 10...contractions started again, and this time Amanda knew she wasn't dehydrated! Jessica was keeping me informed of how things were progressing. The snow hadn't really stopped since Saturday and a huge storm was predicted for Tuesday night. Around 5pm with Amanda 4 cm dilated and contractions 4-5 minutes apart, I headed to the hospital. 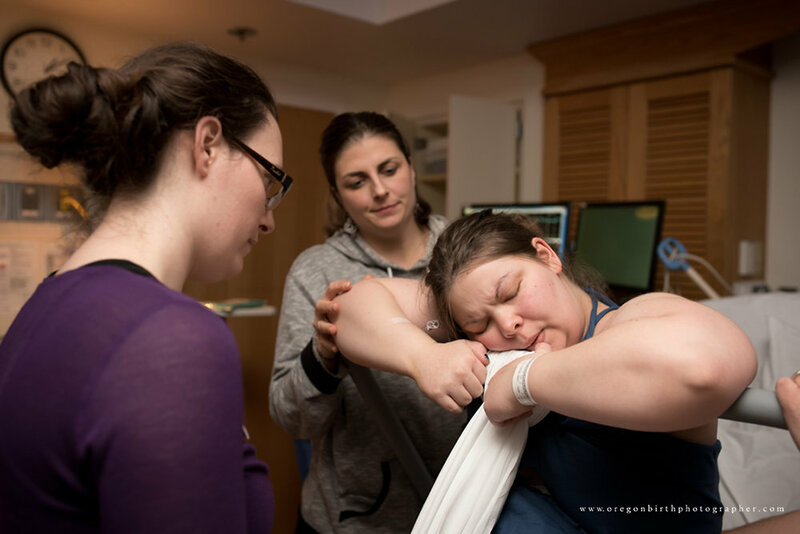 She was supported by her doula, Jessica, as well as her sister-in-law, Laree, (who also happened to be a doula) and her husband, Ben. Sometime around 10pm, Amanda's contractions started to slow, and she was around 5cm. The snow had started coming down really hard by that point, so I decided to take a break for a couple of hours and see what happened. Amanda continued to labor naturally all through the night. She took some time in the tub as well as walking the halls. She was surrounded with SO MUCH LOVE! Jessica was amazing...applying counter-pressure and teaching Ben how to do hip squeezes with every contraction. My arms were sore just watching this labor team support her. And Amanda was SO STRONG. I'd never seen a mama with such resolve and focus through each contraction. She was determined to labor naturally and doing so beautifully. She had started feeling nauseated and had thrown up several times. Around 8am of January 11, at 6cm, she had her water broke. Unfortunately around noon, they realized they may not have actually broken, so they broke it for a second time. She continued contractions and they started picking up. She started to feel the urge to push, so we ran to get someone to do an internal check. She was dilated to 8! We were making progress, but it was going slow for sure. This happened a couple of times. Amanda refused to get discouraged, and I was blown away by her power. Because the snow storm had hit full force (nearly 6" had fallen - that's a ton for Portland! ), we were unable to leave the hospital. In fact the freeways and major roads were being shut down unless you had chains. The waiting room was littered with visitors and staff. Providers were camping out in the on call rooms, and our birth team took turns sleeping in the waiting room. Amanda kept her focus and continued to ride each contraction from peak to peak. At one point, Jessica read a prayer she'd written out, asking Jesus for strength and comfort for the rest of the journey. We all laid hands on her and prayed over her. I had no idea where her determination was coming from other than a higher power. I was beyond exhausted, so I knew Amanda had to be completely spent. She was able to sleep for a few hours. Around midnight on January 12, Jessica and I collapsed in the L&D waiting room for about an hour before we got notified that Amanda was feeling pushy again. Finally on January 12 at 2:10 am, 43 hours after her first contraction (and 38 hours after I arrived!) little Hannah was welcomed into her mama's arms. All 9lbs 4oz of her! Her adorable chubby cheeks and squishy body was worth every bit of effort her mama and the team had put forth! She was beautiful. Don't forget to watch the fusion video at the end. View fullscreen in HD for the best results.